Did Nintendo Just Out Netflix's 3D Streaming Plans? 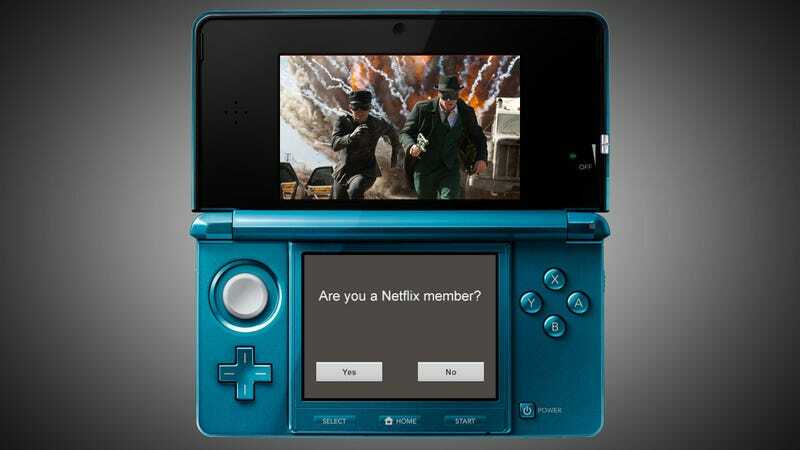 Buried in today's news that Netflix is now live on Nintendo's 3DS portable was a potentially much bigger piece of information: The mammoth movie and TV streaming service plans to start streaming 3D content soon. "The new Netflix application for Nintendo 3DS displays movies and TV episodes in 2D on the system's upper screen," the press release reads. "Users will soon have access to an additional library of select movies that can be viewed in 3D without the need for special glasses." The ambiguous wording led me to contact Nintendo which confirmed that 3D streaming will indeed one day be provided by Netflix and that 3D movies wouldn't be part of the stand alone service Nintendo is unveiling down the line. The 3D video service, Nintendo of America president Reggie Fils-Aime told our own Stephen Totilo, includes 3D trailers, curated (perhaps funded) videos and music videos. Fils-Aime was clear that service wouldn't include full 3D movies. He also referred to Netflix streaming as a 2D service. Last summer, Nintendo president Satoru Iwata hinted that Nintendo was in talks with studios about showing movies on the portable. Reached for comment Thursday, Steve Swasey, Netflix vice president of communication, said that the company has not yet announced anything about 3D streaming. When pressed he declined to say whether Nintendo was incorrect in saying that Netflix was soon getting into the 3D movie streaming business. Neither Netflix nor Nintendo have responded to follow up questions seeking clarification to the apparent conflicting statements. One possibility is that Nintendo was mistaken, the other is that Netflix just didn't want to announce the upcoming service yet. Update: Nintendo responds with the following statement: "The press release announcing the new Netflix service for Nintendo 3DS also references the system's upcoming short-form video service. Nintendo 3DS owners soon will be able to enjoy free, specially selected video content that includes 3D movie trailers, comedy clips and music videos."